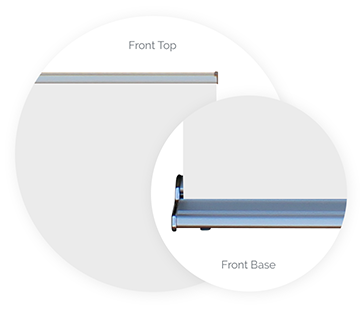 The Steppy Banner Stand is an elegant banner stand solution with chrome accents that looks at home in even the most polished, upscale environments. A substantial 15 lb. 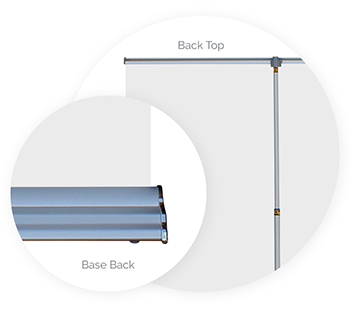 base anchors the system, providing stability and reliability. Your high quality 33.5"x81" vinyl banner come preinstalled by Printastic in the Steppy base, making his banner stand ready to use upon arrival. The banner media is attached to an internal leader strip with adhesive, making it suitable for single image use. The banner is extended up and fastened with a plastic tongue to the expandable support leg. The Steppy banner stand includes a fabric case with business card holder, which makes it easily identifiable at busy trade shows. In addition, the zippered case features a carry handle and adjustable shoulder strap for easy transportation. The Steppy Banner Stand from Printastic is an economical solution that looks good, is easy to use and provides long lasting reliability. Its generous 33.5" width is the ideal size for a wide range of indoor signage applications that is only limited by your imagination!